Okay couples looking for something ...just a little bit something over true luxury for the wedding consider the crystal back drop for any type of western or cultural wedding ceremony. Whether it's evening gala (imagine this all lit up) against the ambience of a dark room, or used during traditional muslim nikkah ceremony, or set up as mandap for this a traditional Hindu wedding this decor piece will be a major focal point for any wedding. Call Dale or Harvinder to schedule an appointment to check out it for yourself. The image is pretty good but wait until to you see it in person. Absolutely stunning!!! I'm not sure exactly how long it takes to set this piece up; but it is quite intricate and requires meticulous attention to detail; a load of patience but wow...once it's up ...it's definitely worth it. 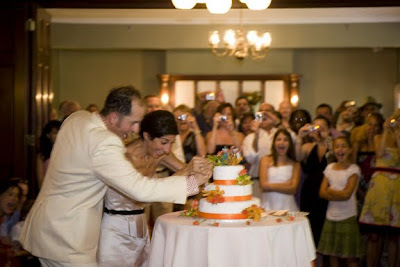 Moore Wedding Centre is conveniently located in Payl Business Centre in Surrey BC. For more details check out their website . Tami was back in Toronto, helping take care of her nieces who were visiting from Israel and Chris came out for a week. While visiting, Chris asked his mom for his great grandmother’s wedding ring. It’s a beautiful simple band with a small diamond starburst. On the last day of Chris’s visit, he and Tami decided to go raspberry picking with her nieces, Tami’s sister Hadas and her brother-in-law Yosh. Eventually everyone spread out and Chris called Tami over to see the most amazing raspberry ever. Humoring Chris, she went over and saw the ring, hidden behind a leaf. Chris said, “You make me berry happy. Will you marry me?” Overwhelmed, Tami started bawling and kept asking, “Are you serious?” Everyone looking on thought they had had a giant fight. The couple decided to get married in the summer in Vancouver. For those of you who have never been to Vancouver (although it rains almost every other day; Tami and Chris were blessed with incredible rain-free weather. 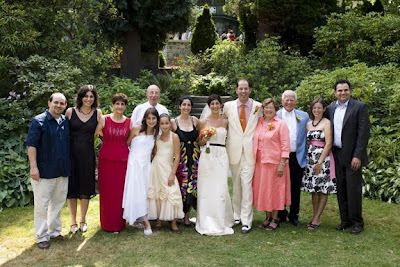 They organized an egalitarian Jewish wedding that was officiated by the wonderful Rabbi Hillel Goelman. “Rabbi Goelman was wonderful. He met with us many times before the wedding day to make sure that we were ready for this commitment. 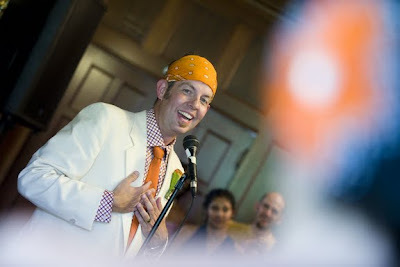 On our wedding day, he made everyone feel comfortable and engaged. He played guitar and had everyone singing, which added to the joyfulness" says Tami. The day began about 45 minutes before the guests arrived. 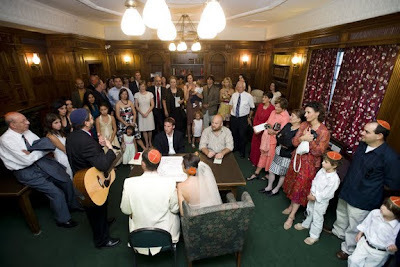 Traditionally, about 20 family members and close friends gather for the signing of the Jewish marriage certificate known as the Kettubah. “But the room was so hot we left the door open and as guests arrived they peered in and joined us,” Tami says. “I started slightly flipping out and whispered, ‘Oh my god. They think it’s the wedding. They don’t know it’s the Kettubah.’ Chris calmly answered, ‘It’s okay. We’ll just have the biggest Kettubah in history.’ So they did! After the signing of the Kettubah, Rabbi Goelman had Chris and the men go to one side of the room while Tami and the women stayed on the other side. The men each laid a hand on Chris, and if they were too far away, they put their hand on the shoulder of someone who was touching Chris. The women did the same with Tami. Then Chris and Tami closed their eyes and the group moved them together. Tami and Chris then opened their eyes and saw each other for the first time as husband and wife. Of course everyone including Tami laughed like crazy. 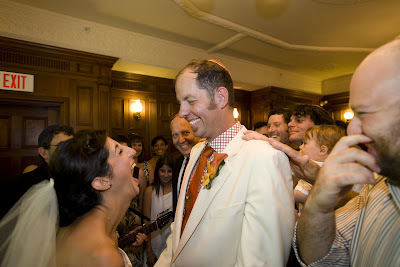 The ceremony was a traditional Jewish ceremony, but they added a few twists. 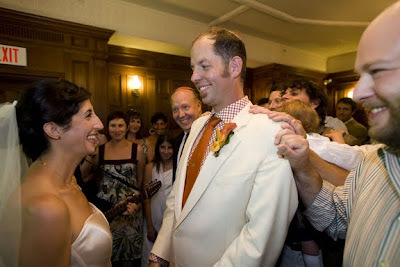 Another twist involved the tradition during the ceremony when a bride walks around the groom seven times. Both Tami and Chris realized that they wanted to do something a little different, so they each walked around the other three times and then walked around the wedding circle to include their guests. The ceremony took place outside on the grounds, surrounded by the beautiful gardens, where the couple also took family photos. 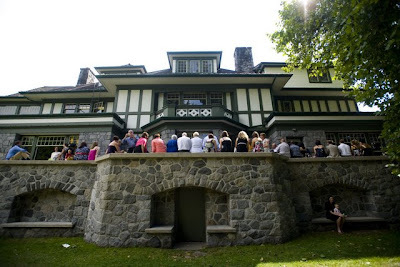 The reception was held in the Aberthau Mansion and spilled out onto the patio and lawns. Besides the historical character, picturesque setting; they also allow you to bring in your caterer which really works for many couples. On a side note: I happened to catch a wedding story on CBC a few weeks ago titled 'Wedding Bills' and there was a segment about the Bride's Project. Really, a great choice for brides wanting to make a conscious buying decision. I'm not surprised that Tami picked out her very own dress from here as well. As another surprise, Chris and his best friend performed Weezer’s “El Scorcho”. When they first dated, that was the song that Chris sent to say he had feelings for Tami. The words said it all: “I think I’d be good for you and you’d be good for me.” Chris was a rock star performing truly from the heart. Tami bawled. Again. April Bellia from April Cakes created the most beautiful wedding cake. “She truly took the time to get to know us and captured who we were with strawberry shortcake and fondant,” Tami says. “We felt her warm wishes in every bite! 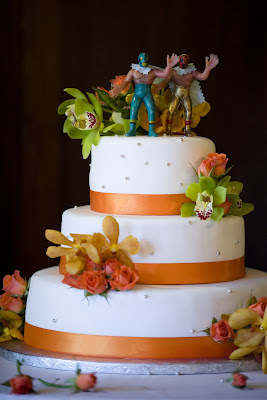 For cake toppers we decided to go with Mexican wrestlers we had kicking around the house. She even made sure to have one wrestler touching the other’s bum! Keep that in mind brides...it's all about the littlest tiny details that make things so memorable. To wrap up the day, Tami and Chris got an ice-cream truck to show up. Guests could order whatever they liked. 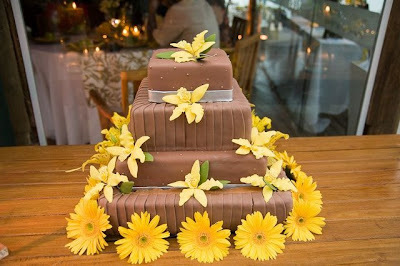 It was great way to end the wedding on a sweet and unusual note. To see this great shot see Tami & Chris Part 1. I love, love, love creamsicles!!! You know the best part they're only something like a 100 calories. Can you believe it? I had to include a shot of their beautiful family! As a newlywed, Tami’s advice on a successful marriage is to avoid getting “hangry” with each other (that’s hungry and angry). If you’re both well fed, reason will usually prevail. Congratulations Mr & Mrs. Cool! One of the things I love most about summer besides weddings is Creamsicles. You know the ones I'm talking about (orange on the outside and vanilla ice-cream inside). So what do Creamsicles and weddings have to do with one another. Check out this picture. I love this shot! 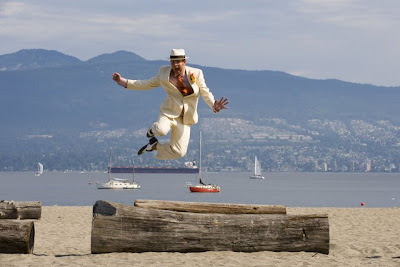 Photographed by the very, very talented Vancouver wedding photographer Hamid Attie of Tami & Chris. Tami & Chris had this great idea of renting a Popsicle truck so their guests could indulge in a little summer nostalgia. I was so tempted to title Tami & Chris's wedding profile in the Cultural Wedding Planner - Introducing....Mr & Mrs Cool because I can't really think of any better words to describe this couple. I met Tami in 2007. She's the boss of Fortuna Fortuna Birdy Productions Inc. but was working as an independent producer for CBC - Living Vancouver. Tami was producing a segment titled 'Off White Weddings' and asked me to be the Cultural Wedding Specialist talking about all the "should and should nots"that brides and grooms need to consider when it comes to their dream wedding including her own. I was pleasantly surprised at how fun and easygoing the shoot went which took place at the beautiful Vancouver wedding venue: The Hyatt Regency (thanks to Naved Noorani). There were a few moments of Tami's spontaneous acting skills which kind of took me by surprise but I caught on quickly. My 2 bits turned out be 6-bits and ended up in approximately 6 segments of her series. I'll try to add a few links of the footage to the blog as well just in case you'd like to see it. Tami and Chris had a Jewish wedding at the gorgeous Aberthau Mansion which is a beautiful heritage Tudor-style mansion located at West 2nd Avenue and NW Marine Drive in posh West Vancouver (very close to Jericho beach). 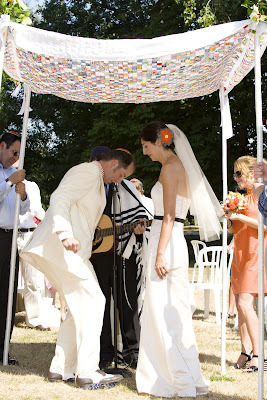 They customized the actual Jewish ceremony by modifying existing traditions and creating their very own. I think that's the coolest thing when couples create their own traditions. It makes the wedding more personal and meaningful. I also love the fact that Tami and Chris didn't go for a 'typical theme' in a way. They went more for an attitude which was clearly evident of who they are as a couple and most probably why their friends and family love them so much - me included. I haven't had the opportunity to meet Chris in person though; but I know him well enough from the pictures that if I ever saw him; I would know who he was and all the little details about his wedding...which would probably freak him out a bit (that did happen to another groom I met at the Westin Bayshore last year...that was fun and another blog). Their theme according to Tami, "A little irreverent, a little quirky and not so serious"; hence the published title of Tami & Chris's celebration of love in the Cultural Wedding Planner. One common Jewish wedding tradition is for the groom to break a glass with his foot; representing the fragility of life and marriage. 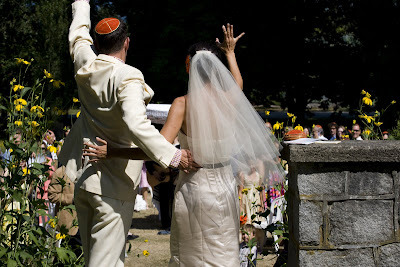 I'll be discussing some of this and other Jewish Wedding traditions more in part 2 of Tami & Chris's Traditional Jewish Wedding. I'll also tell you how they specifically customized everything. More updates to come in the next few days. Until then...be sure to indulge in the simple pleasure of treating yourself to a Creamsicle. Before I leave: a couple of more amazing shots of Chris in action, Tami just being her beautiful self and Hamid's talent of capturing it all. I love this shot. My most favorite spot in Vancouver - Jericho beach. I've spent more time here than anywhere else on the planet so far. Perfect location for wedding pictures in Vancouver and some not so good burgers in the summer. Hint-- pack a lunch! Doesn't it just feel like the summer days just run away. With the 'to do lists' stretching and the long days: it seems that more rather than less should be done but sometimes it's just time to sit back and sip an ice-cap. The caffeine rush and some icy cold should help you bring it all back into perspective. Well the weeks been hectic not to say the least: but I wanted to add some tips for brides getting their henna done in the next few weeks. And if you haven't already be sure to book a henna artist for your bridal party as well - get on it. Henna artists are limited and high in demand during this season - so if you're waiting - what for? If you've already booked your henna artist try to schedule your henna to applied at least 2 days in advance of your wedding if you can. I've included a few more tips below which are taken from The 7th Edition of Canada's First South Asian Wedding Planner. If you don't already have your copy stop by any of the following locations and pick yours up. 1) Chapters Indigo Book Stores (72nd & Scott Road in Surrey, BC - Strawberry Hill Complex) 2) Kamal's Video 3) Delta Wedding Centre 4) Moore Wedding Centre 5)Bride & Groom Shop 6) Most HBC (The Bay) Gift Registries in the lower mainland Vancouver, Surrey, Burnaby, Abbotsford, British Columbia See my blog about her below. The gorgeous images on the most part were photographed by Milan Photo Images, and the incredible mehndi is done by none other than Iti - of Mehndi Designs - one of Vancouver's premier henna artists. 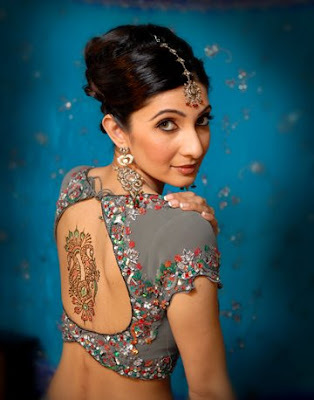 1) If you are booking a henna artist for a group, be sure to discuss price before booking. Some times you can work out a package for a specified number of bridesmaid: be sure to discuss how intricate or not the design will be prior. Remember the more work: the higher the prices 2) Be patient. Applying mehndi is an art (visualize an artist painting on a blank canvas). In this case, you are the canvas so try not to fidget or squirm. Bridal mehndi application is a lengthy process sometimes taking 3 hours or more depending on the design you choose. Help yourself by having a good meal before the henna artist starts and pick out a couple of good Bollywood movies (average run time is 3 hours so you should be good); oh yeah and another very important thing: go to the bathroom before she starts. 3) Henna has a cooling effect so dress warmly and depending on the season you may want to have a heater close by. If it's hot and humid: you will feel great! Okay ... so get the rest of tips from your henna artist. And remember; henna isn't just for the hands. For any flattering figure: have it applied anywhere anytime - awesomeness! It's going to be a busy week. I'm kind of getting overly excited about all the weddings I want to blog about; all the fabulous photographs but instead have to take the advice I tell brides when they call for wedding consults: do one thing at a time and you end of getting way more done. Well...that's kind of hard: I mean after all - it is summer, lazy days, warm weather, bbq's, sitting on your patio with you laptop and of course celebrations of weddings from all different cultures. Yes, the summer season is upon us and promises to be exciting for brides and grooms AND wedding suppliers alike!! 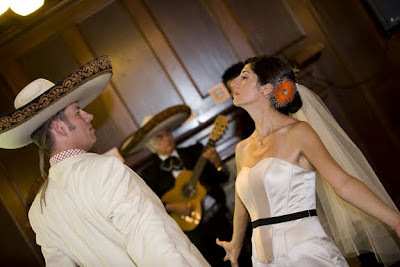 Today I'm going to share with you a wedding that really, really represents true culture. I'm not surprised that Lara from Greysquare Photographics; a fabulous Vancouver BC based photographer had the pleasure to photograph (and boy did she ever do a fantastic job)!!! For those of you who don't know Lara: here's a bit about her: she's easy-going, friendly, a fantastic photographer (mentioned already), has been part of Cultural Weddings for at least 4 years now (her editorial work is featured in the Cultural Wedding Planner every year) and she is joyful. Yes, joyful. That's not a word that you can designate to just anyone. Really! When you speak to her: there's always an undertone of joyfulness and laughter in her voice. Imagine a photographer that's talented, joyful, affordable, and nice! What more could you ask for? So enough about Lara. You can visit her website if you want to know more after you read about all the details of Kim & Greg. So a bit of background about this specific culturally influenced wedding. Kim is from a Chinese/German background and Greg is from a Ukrainian/Canadian background, they are both vegetarian. 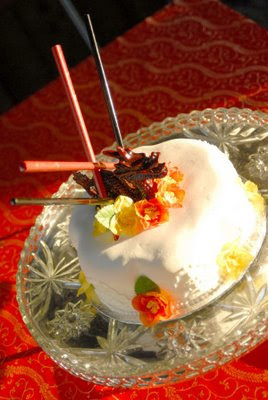 In their wedding we see many hints of the Asian motif and in the food we see the vegetarian and Ukrainian influence. They are a very ‘tongue-in-cheek’ couple and their sense of humour shone throughout the wedding; in their favors, in the wine labels, and many other elements in their wedding. The back of her dress received many comments on the Obi inspired design it had. Here is one of my most favorite images of Kim. She wore a Cheongsam, a traditional Chinese dress, as well as a traditional European/North American white(ish) dress. She also incorporated Chinese tea sets (a tea pot and cups) into the centerpieces in honour of the tea ceremony tradition, but they didn't actually do a tea ceremony. Which just goes to show you that couples can personalize any custom; any way they choose and make it their own. It's all good...do it your way! Greg picked out a very formal tux. Black pants, jacket and vest. White shirt and tie. Apparently it is a Polish superstition that the men in the wedding party cannot remove their vest during the wedding. When I asked Kim about her theme she said there really wasn't a theme in a traditional sense. Rather Kim wanted to have a wedding that reflected both their personal styles; one of happiness and joy (hence the perfect reason to have Greysquare Photographics document their wedding for them). She made all of the tablecloths out of sari fabric and each table was a different colour. " I wanted everything to be colourful and happy. Some weddings are so somber and that wouldn't reflect Greg or I." she says. Garlands Florists made the bouquets, boutonnieres and corsages. Kim was definitely a DIY bride. 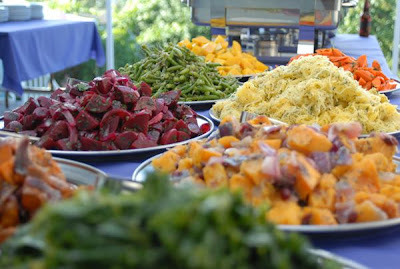 She put Greg in charge of organizing the food (doesn't it look fabulous..apparently it was all vegetarian). She said "I honestly didn't even know exactly what was happening in regards to the food, but I trusted that he likes food enough to do a good job planning it all. And our friend, Michel, who made it all, is an incredibly talented chef." When I asked Kim what she still envisions from her wedding day she says " not being able to stop smiling. 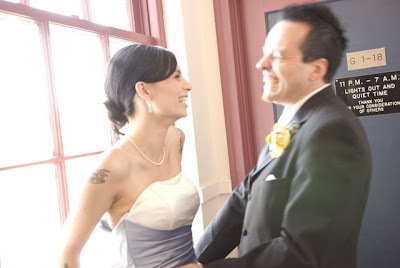 Even the entire way down the aisle, all I could do was smile." - and for obvious reasons Kim. You did an unbelievable job with your wedding. Everything looks amazing. Kim's advice to brides and grooms planning their wedding: "If you don't want waterworks while walking down the aisle, keep your eyes on your man. All the ladies in the crowd are going to be blubbering and as soon as your see them, you'll be done too. Besides, you don't want to miss the look on his face when he first sees you!" Well said Kim!! Hands down: Kim is very, very organized She even sent me a spread sheet to look at! Next thing she did to help get a handle on her wedding planning was to visit FrugalBride. She also attended one wedding show where she found Shi Studios who made gifts to the girls in her wedding party. She got them to take a piece of the fabric from her Cheongsam and made pendants for the girls, it was a perfect gift. I wish Kim & Greg a colourful happy marriage. Thanks for sharing your details and a special thanks to Lara! One of most unique and sought after cultural wedding suppliers specifically for Indian weddings is none other than the henna artist. Remember back in the day when some designated aunty-jee would apply the bridal mehndi with a tooth pick? or what about the evolution of the stick-on mehndi patterns that were supposed to be fool-proof and guaranteed that anyone would have gorgeous mehndi for their weddings. Okay then came the mehndi cones. Yes, foil conicals filled with mehndi that is easy to apply - now if you only have the artistic ability to actually use this thing to create more than happy faces and flowers. Fast forward... the art of mehndi actually applied by professional mehndi artist. Iti really is an artist at heart and takes her work very seriously but makes it all fun. Her artistic ability is clearly evident when you see her work and her designs. Her hand is steady and the lines are clean when she applies the mehndi. She uses some special scented oil that doubles up as an aromatherapy session when she's applying the mehndi . Actually I'm not sure why she uses it but is smells really refreshing. When she's done the henna pattern comes out vibrant and bright. The superstition of the lightness or darkness of the brides mehndi as an indication of how much the bride's mother inlaw will love her; is pretty much a right-off because every bride who gets their mehndi done from Iti will have dark mehndi. What a relief!!! I wish I had known about her when I got married. Seriously, the lady who did my mehndi told me to put plastic bags over my hands after it was applied. After I met Iti, I found out nobody should ever do that. It makes your hands sweat and smudges the mehndi...YES of course!! She's got a lot of other great tips but to get all details of her experience you can give her call. She has done my mehndi for some special events a couple of times and I have to tell you she has patience. Not only to do the mehndi but to make the 'mehndi-receiver' be patient as well. If you are looking for one the best henna artist in Canada; specifically in Vancouver or Surrey then be sure to talk with Iti first. She's great with getting back to people so leave a message if you get her voicemail. Just a few more tid bits about Iti. Did I mention she's pretty nice. And she does awesome bridal mehndi, mehndi parties for the bridesmaids and family, Arabic mehndi, temporary henna tattoos (do a trial before you go for the big bang permanent one), 2 colour and silver and gold mehndi if you really want to coordinate your bridal outfits with your looks. I'll be adding some tips for the bride if you are getting your mehndi done anytime soon. Angelica and Chris wanted a wedding that reflected their personalities which meant: the beach, sun, tropical food and good music. Their chosen theme a rustic beach wedding in a beautiful village on the coast of Brazil. 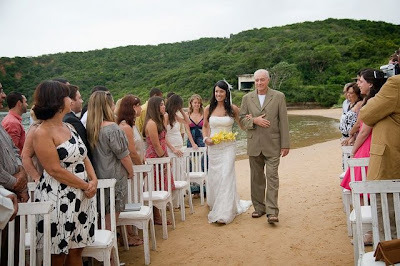 To be exact, the wedding took place on the warms sands of Tartaruga (Turtle) Beach in Buzios, a small city on the coast outside Rio de Janeiro. 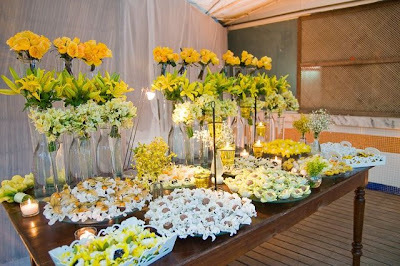 Their theme was natural, feel good, uplifting - beige and yellow which complemented the natural surroundings of the beach (just the right amount without going overboard). OOOh...look at their cake! I absolutely love it!! DIY bride Angelica planned and purchased every single detail of the decor which by the way is absolutely stunning!! Every little detail was planned and coordinated to perfection. She designed and produced the invitations, menus, wedding website and favors. While some brides are stressing over other details she also planned and customized every single detail of catering and wedding decor. She decided to hire a professional decorator to execute the decor plan on the actual wedding day so she could take-in and really enjoy herself. shells, pumpkin cups or earth bowls and the decorations with ample candles and and nautical lanterns, beautiful rustic wood-crafted furniture and a lot of white fabric. Besides a DJ, they also hired a real school of samba with all its dancers to surprise the guests with a one-hour show. 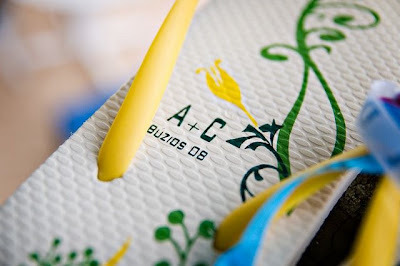 And my personal favorite part of the wedding was the personalized Hawaiian flip-flops they gave to their female guests who could take off their high heels after hours of dancing. See the great photo below. For those of you who didn't catch it, she used the same design that was incorporated on their wedding invite. As Brazil is a Catholic country with a great influence of Afro religions that were brought to the country during slave times, some special wedding rituals have become part of Brazilian culture. Therefore, on the morning of the wedding day, at the beach where the couple would later be married, the bride and groom followed the ritual of Yemaja, the Sea Goddess. It’s a cultural religious tradition to first ask the blessing of the Sea Goddess to have happiness and fertility in the marriage. The ritual consists of jumping seven waves before entering the water and then asking the goddess for a blessing before diving in. “According to the cultural belief, the saltwater cleanses our body of bad thoughts and negative energy, preparing us for the wedding to come,” Angelica explains. 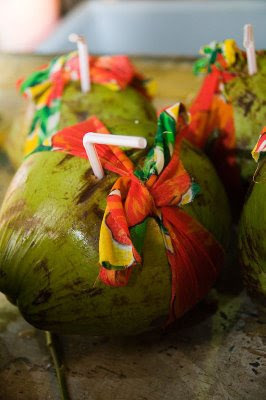 During wedding, they also distributed colorful wristbands called fitinha do Bonfim, traditional lucky religious bracelets originally of northeastern Afro-Brazilian culture that are believed to give the person the right to ask for three wishes. As for this DIY bride: her wish for an absolutely amazing wedding on a beach came through: Great job Angelica! Congratulations to you both - thank you for sharing all these gorgeous details with us. So here it is: the short of it ( you and read the long and detailed version in the Cultural Wedding Planner - pick it from most HBC Gift Registries in BC). One of the couple’s favorite things to do is travel and Las Vegas was definitely one of their favorite fun destinations. One night Chris surprised Angelica with two tickets to Vegas for the long weekend.When they arrived in Vegas she was pleasantly surprised to know that there was a beautiful room, in front of the water fountains, reserved at The Bellagio Hotel (in my opinion one of the most beautiful hotels in Vegas). The following day, after a breakfast by the pool, Chris told her he wanted to take her somewhere special but refused any details.He drove through the famous Las Vegas strip and she was surprised to see that he was entering the airport area and parked beside some helicopters. But wait:....he didn’t propose there. When they got back to the Bellagio , there were more surprises including: Cirque du Soleil’s “O” show which was followed by dinner at the Picasso Restaurant at the Bellagio. Not catching on to any of this or Chris's plan: the manager came to their table to inform them that their table was outside on the balcony (where dessert would be served). When they got outside there was only one small table, by the edge of the balcony, beautifully decorated with flowers, two candles and two glasses of champagne. Then, when the fountains started their show, dancing to a song by Pavarotti, the waiter came to bring dessert and right after came back and said: The chef has sent something special for you” and placed a dish with flowers on the table. Angelica still not getting it: took a while to see something sparkly inside one of the flowers. It was a ring! When she looked back at Chris, he was already on his knees! Angelica quotes: "It was perfect! I couldn’t ask for anything better than that. It was not only one special moment, but a very special day, full of wonder and romance.” Yes Angelica - we definitely agree! Yes...it sounds perfect. This really sets the proposal bar really high. What an amazing, meaningful, well thought out proposal. Wow!!! For any grooms looking for ideas: this is definitely an inspiring way for any women to be proposed to. You know what happens in Vegas doesn't always stay in Vegas. Stay tuned for the features of their wedding including the amazing color palette and all the little details Angelica fine tuned. Can't wait to share it with you but if you want more be sure to pick up your copy of the 2009 Edition of The Cultural Wedding Planner where you will find all the bright, gorgeous details along with some of Brazilian wedding traditions. Stay tuned for Part 2 and vibrant photographs by Juliana Pessôa Photography.